What is this man doing with a Starfleet mini-skirt? 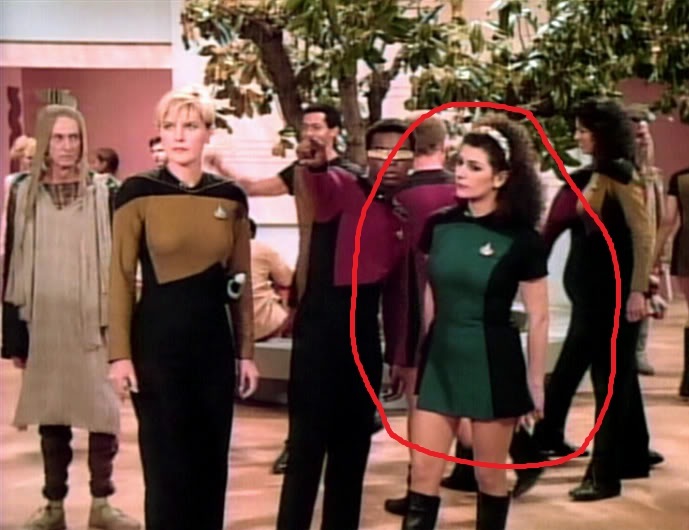 In the Star Trek: The Next Generation episode "Encounter at Farpoint", we see Deanna Troi wearing some kind of mini-skirt uniform. I did not remember this before, as Troi wore more casual clothing later in the show, but I thought it was a great tribute to Uhura's uniform in the original series. While I did not see all of the TNG episodes, I do not remember anyone else wearing this kind of outfit. It's just that I wouldn't see Picard (or worse, Worf) wearing that! I could imagine it's the next step in gender equality, but how did it come in the show and how it left? Introduced alongside the standard duty uniform jumpsuit, a skirt or "skant"-style uniform was also available to Starfleet officers as early as 2364. Similar to its jumpsuit counterpart, the skant uniform was a short-sleeved one piece skirt, that could be worn with or without trousers, and included thigh high, or shorter, black boots. It was worn by both genders –though men tended to wear the shorter boots –until it was phased out of service some time before 2365. (TNG: "Encounter at Farpoint", "Where No One Has Gone Before", "The Child", "All Good Things..."). According to the book The Art of Star Trek, "the skirt design for men 'skant' was a logical development, given the total equality of the sexes presumed to exist in the 24th century." The uniform was used primarily by background actors, though "Encounter at Farpoint" featured both Deanna Troi and Natasha Yar in skant-type uniforms, the latter only briefly. While Troi got a new look entirely for subsequent episodes (according to the Star Trek: The Next Generation Companion the uniform was referred to as the "Space Cheerleader" look), Yar remained in her jumpsuit uniform for the rest of her stay aboard the Enterprise, never donning the skant after the pilot episode. Male crewmembers wearing the skant were only seen in few episodes, "Encounter at Farpoint", "Haven", "Conspiracy", "Where No One Has Gone Before" and "11001001", though the footage seen in the last episode was re-used from "Where No One Has Gone Before". The skant was primarily seen in the first season, appearing only four times, worn with black trousers, in the second season episodes "The Child", "The Outrageous Okona", "The Schizoid Man", and "Samaritan Snare". After that its final appearance was in the flashbacks during "All Good Things...". Don't forget the dress uniforms, they also are very skirt-like. In all likelihood it became fashionable for men to wear skirting tops some time before 2365. So popular that they became available as the "skant"-style uniform and eventually replaced the dress uniform. 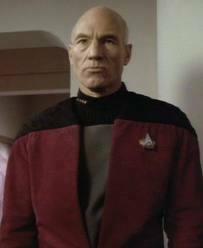 The style's popularity waned and the jacket style rose as seen at the end TNG and the Beginning of DS9. 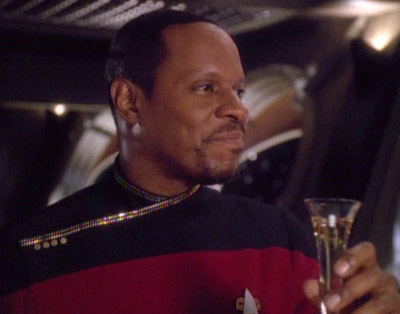 Although the skirt-style dress uniform was still used when Sisko was promoted to Captain in Season 3. I could not get a full length shot, but the collar is the same. In the YouTube clip when Sisko walks back from talking with the Ambassador you can see it flares below the waist with black pants below. 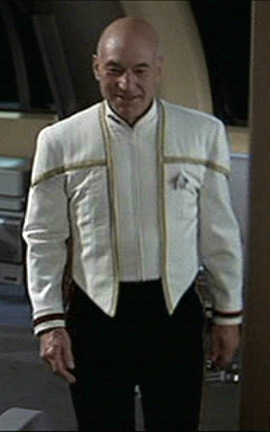 Eventually the jacket-style uniform filtered up, replacing the dress uniform standard with that seen in Insurrection. In short, styles change, especially when you are influenced by thousands of different cultures on thousands of worlds. Scotty had a kilt dress uniform as can be seen on the Memory Alpha wikia page for Kilt. So there is precedent. Star Trek routinely tackles real life sociological issues in its stories. Racial equality (Lt. Uhura), sexual equality (calling female officers Sir, among others), drug addiction (T'Pol), etc. 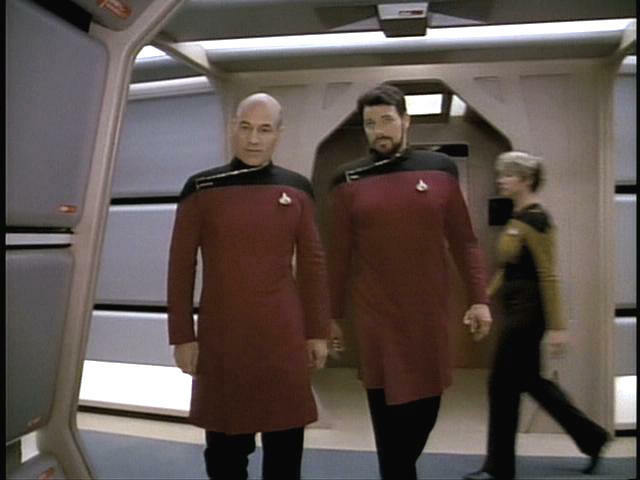 The only time in TNG we see male crew members wearing dresses (face it, they're dresses, not "skants") is the first episode, "Encounter at Farpoint". The first episode, often called a pilot episode, is a proposal for a new TV series. They created "Encounter at Farpoint" to demonstrate to the network execs what they wanted to do. Since we never saw the man-dresses again, the network execs probably said "Sure, we'll do this show, but men in dresses? wtf? no." Not the answer you're looking for? Browse other questions tagged star-trek star-trek-tng star-trek-uniforms or ask your own question. What is the basis for Zapp Brannigan's uniform? Was this the only example of a Starfleet issued hat?